Join us for our next meeting full of updates and next directions for the VFPC as well as a conversation on migrant farm labour in BC with Joana from SFU and Felix of the Agriculture Workers Alliance May 28 6-8:30 PM, Town Hall Room, Vancouver City Hall. Felix Martinez has worked with temporary migrant agricultural workers since 2008. He worked at the Mexican Consulate as an officer for the Seasonal Agricultural Workers Program until 2011, where he, along with 2 other co-workers blew the whistle on the Mexican consulate for the blacklisting of workers who attempted to unionize. In 2012 he started working with the Agriculture Workers Alliance, applying his knowledge of the program to help the temporary agricultural workers organize as well as to push for the change of policies within the program. Joana Bettocchi-Barrow is a graduate student in the Latin American Studies Program at Simon Fraser University. Currently completing an ethnographic study, she is researching Central American migrant farm worker’s access to health services in BC and Ontario. She has a Bachelor of Arts in History and Latin American Studies from Simon Fraser University, where she completed an undergraduate thesis focused on the impact neoliberal agricultural practices have on migrant farm workers in Canada. 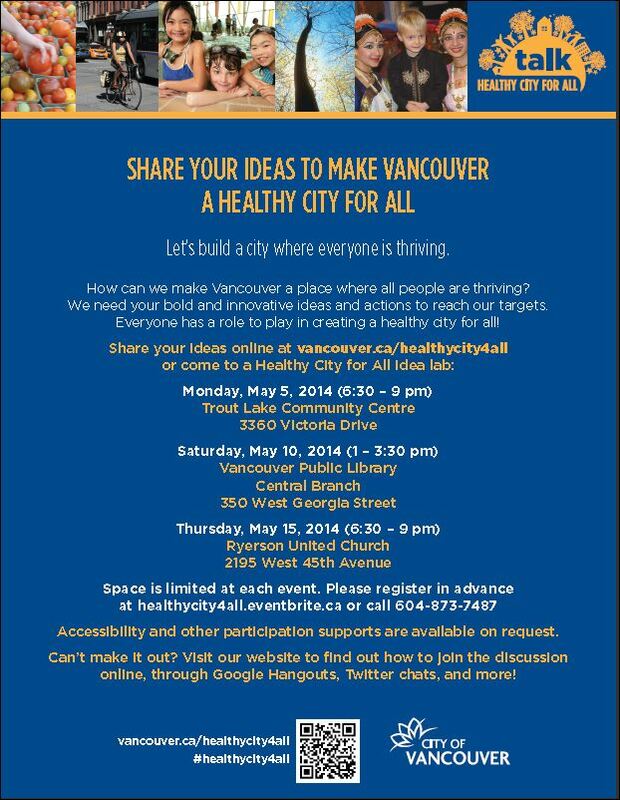 The City of Vancouver has launched its public consultation process for the Healthy City Strategy. Learn more and find out how to have your say here.